Botox. It's pop culture. You know its used cosmetically. You know or know of someone - or many someones - who have had it. For those concerned with wrinkled foreheads, laugh lines, or crow's feet it provides a minimally invasive, highly effective treatment. Its a bit spendy. But in our no matter the cost for whatever makes me feel good and look good culture... Well, folks pay. 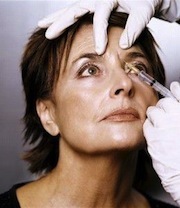 Botox works by relaxing muscle contractions. Its a powerful neurotoxin. Injected with a fine needle for precision and minimal discomfort, the cosmetic effects take place in a few days and last for four to six months. But did you know that Jesus is better than Botox? Ephesians 5:25-27 uses marriage as an example of how Jesus purifies and perfects his bride, the church. That's you and me, Christ Follower. There you have it. No stains. No wrinkles. No blemishes. No needles. No neurotoxins. Just Jesus. Guaranteed to improve your appearance. And your life. If you got a chuckle or encouraged by this post, then please subscribe or comment. Thanks to my wife for this idea!